I'm having issues deleting a directory on my macOS Mojave 10.14.3 system. 786499 drwxr-xr-x   3 kk  staff    96 Feb 26 18:56 . 430961 drwxr-xr-x+ 49 kk  staff  1568 Feb 26 21:50 ..
Notice that the link count for the directory is is 3. A freshly created empty directory has a link count of 2. No other file or directory on the system has the same inode number (this was checked using sudo find / -inum 786499), and I believe that directories on APFS filesystems can't have additional hard links anyway (like they can with HFS+). The operation can’t be completed because the item “strange” is in use. However, running sudo lsof "$HOME/strange" (after returning the directory to my home directory) returns nothing, and rebooting the machine changes nothing. Using sudo lsof +L1 (listing open files with a link count of zero, i.e. deleted files kept open by some application) also does not reveal any paths under the strange directory. Making a copy of the directory using the Finder creates strange copy. This copy directory has a link count of 2 and can be deleted. 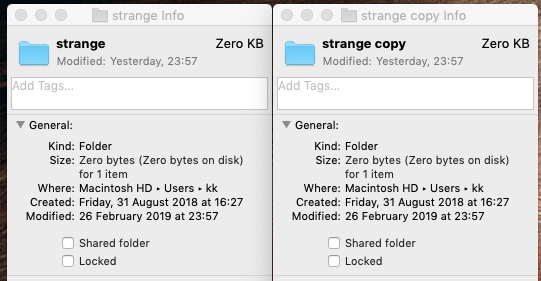 Curiously though, the "Get Info" dialog in Finder says that each directory (original and copy) contains an item (it usually reports zero items for freshly created empty directories). drwxr-xr-x   3 kk  staff    96 Feb 26 23:57 .
drwxr-xr-x+ 49 kk  staff  1568 Feb 27 10:36 ..
drwxr-xr-x   2 kk  staff    64 Feb 26 23:57 . Running "First Aid" using the macOS "Disk Utility" does not change anything (returns "Successful" at the end). This regardless of whether this is done on the live system or in Rescue Mode. This does not seem to be repaired by fsck_apfs though. Any clues as to how to go about deleting this directory? For those who wonder, the directory was initially found as a subdirectory of a Steam game (Factorio, release 0.17.0). The original path of the directory was ~/Library/Application Support/Steam/steamapps/common/Factorio/factorio.app/Contents/data/base/campaigns/demo/locale/ru. The part from demo downwards caused the game to not start properly (it was, apart from the directories, empty, but the game tried to pick up some non-existing file from the demo directory and crashed). Moving the directory away made the game playable, but I later discovered that the bottom-most ru directory could not be deleted. This is the directory that I then renamed strange and that I refer to throughout this question. I have submitted feedback to Apple about this, but I'm no Apple developer so I can't submit a formal bug report. I filed a bug report with Apple and this seems to finally be fixed now in Mojave 10.14.4 (18E226). To fix, update your OS to the latest version. Then reboot into recovery (CMD-R) and run disk first aid. It should show one or more error: directory valence check: directory (oid 0x123456): nchildren (1) does not match drec count (0) and / or error: nchildren of inode object (id 12345678) does not match expected value and repair them. Once it is done, reboot into OS X and you should finally be able to delete the folder normally! Note that although bar, bar/., and bar/l1/.. all are hard links to the same inode, find only lists one of them. where "786499" is the inode number of the strange directory. Not the answer you're looking for? Browse other questions tagged mojave filesystem folders . How to close a file and a folder using bash? What meta-data does iCloud drive save and restore for each file or directory?